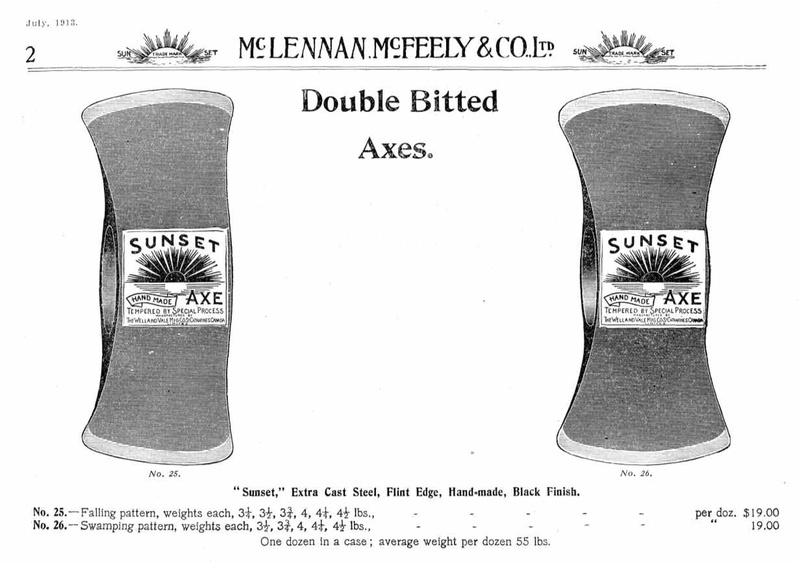 Double-bitted axes, available by the case. It’s pretty common to run into historic industrial equipment when doing archaeological work in BC, especially logging equipment. The Vancouver City archives has put the entire McLennan, McFeely & Co. Ltd Catalogue 1908-14 online, albeit in a somewhat awkward format (hey guys, why not just post a single PDF as well?) (edit: see comments below). This catalogue would have been the ordering bible for many remote logging, mining and cannery outfits up and down the coast, the remains of which are often lying atop shell middens or strewn in the intertidal zone. Altogether, the Vancouver City Archives and the Burnaby Village Museum have put more than 1,500 pages of historic merchandise, as well as ordering and shipping information and price lists. Click on an image and it brings up a legible PDF of that single page. You can jump from section to section, and then scroll through each section or jump to any page, although without knowing what is on that page! It looks like the URLs are stable unlike some projects of this nature, so here are some nice pages: Double Bitted Axes; Steamfitting Valves; Chisels; Peavies and Cant Hooks; Pickaroons and Hookaroons; Ox Yokes and Boot Calks; Potato Hooks; Trowels (no Marshalltowns); Revolvers and Automatic Pistols (includes Mauser with a Wooden Holster); Wire Rope; Blocks; Turn Buckles; Clout Nails and Tacks; Rivets. Mail order automatic pistols: the good old days. Click for better resolution. This entry was posted in Archaeology, archives, history, Technology and tagged archives, artifacts, catalogs, catalogues, guns, historical archaeology; industrial archaeology, history, logging, Technology. Bookmark the permalink. A single PDF is a great idea. We’ll put that together and let you know when it’s up. We welcome feedback. Feel free to contact us directly if you have any other comments or suggestions. Hey, thanks a lot. I think it would be a fantastic resource for historical archaeologists to have — ideally on their laptops in the field so when we find some mysterious machinery or iron on the beach we can have one more clue about what it was for. And thanks more generally for having that catalogue up — what a great thing. I wish I had a hardcopy for my bathroom reading, heh. We’ve created the single pdf and made it available from this page: http://vancouver.ca/ctyclerk/archives/digitized/McMcHTML/index.htm It’s a 270 MB file. If there are any errors, such as pages out of order, please let us know and we’ll fix them. Please remember that this copy is missing Shot Guns 1505/6, and Rifles 1515/16 and 1533-36. We’ve included both versions of pages 405 and 406. Hi Sue, Thanks so much! I put an update on the front page of this blog. I really really love that PDF and at the risk of being geeky will stick it on my iPod and read it on the bus. heh.